However, Watney is still alive. And he has every intention of "staying alive" (a song our hero adopts as his theme song - yes, Watney is funny that way). Mark Watney becomes the first Martian - a good humored, resourceful and the one and only resident of Mars. How he survives on a freezing cold planet with no help in sight and no way to communicate with Earth makes for a terrifically compelling read and the suspense and drama of if/how he ever gets back to Earth is breathtaking. I picked this book randomly and had no great expectations of it - after all, it was from an author I'd never read before, nor even heard of (no, really, I had never heard of or read this author before). I went into this book with zero preconceptions. Well, not exactly zero. I mean, the title led me to expect a book that had something to do with a Martian. Frankly, I never thought that an abandoned Earth astronaut on Mars would provide the Martian in 'The Martian'. Once I got over that pleasant surprise, I was intrigued enough to keep turning the pages, if only to see what happens to Watney. The story unfolds in the form of logs that the lone astronaut writes to describe to future manned missions how he spent what he feels are his last living days on the red planet. Instead it turns out to be an ode to human ingenuity, hope and sheer stubbornness to survive against all odds. The science part of the story is highly complex, appears highly authentic and is described in detail. Minute detail, even. This kind of slows the pace - a lot. Up until halfway point, I read every page even if the science/engineering part of it was going over my head. (At times Watney even dumbs it down for us ordinary readers. Even then it was all a bit too high-brow for me.) After halfway point, this got to me and I began skipping pages. To my surprise, I found I hadn't missed much at all. That there is the reason I took off a 1/2 star. The other is the oddly telescopic vision of the entire story. The focus is almost entirely on Watney. Not much is described about the planet or even other people, like the crew who left him behind. Even what little readers come to know of Watney is through the eyes of other people, of whom there aren't many to begin with in this story. The feeling of isolation comes more from this than the words of the story itself. Another 1/2 star off for this. Overall, I loved the story. 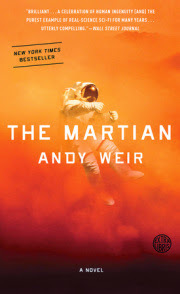 It's very well-researched (the science part, at least) and the author writes in a way that makes it easy for the readers imagine themselves all alone on the barren planet in Watney's bulky EVAC suit. It makes one think and imagine and escape to different world - literally. Note - I got this book all on my own to read and later, review. No compensation of any kind was provided by anyone, anytime, anywhere.